Bought the two twelve packs they had there tonight! This entry was posted in "DO YOU KNOW WHERE...?, "PLAY IT AGAIN...SAM! ", a Caswell limerick poem!, a chance encounter, a consumation highky to be wished (Jeeves), a dark night, A GASTRONOMIC DELIGHT!, a limerick poem, a man;s preferences, a matter of time, a poet's preferred method, a reader's own envisioning, a repeated sales reminder!, a spectacle, A VA-VA-VOOM!!! !, across the years, all in good fun, anticpating and tagged 12-pack of cans, 2-LITER BOTTLES OF MOXIE, a favorite beverage, a regional favorite, craft soda, DIET MOXIE 12-PACK, more--in back?, MOXIE SODA, OH JOY!, SHAWS in Whitinsville--Mass., sold in fewer stores! on November 12, 2018 by Jonathan Caswell. HOW DO YOU KNOW YOUR L.D.E.’S? Look to the prototype hence! A switching design loudly pops…. Makes a switching puzzle that rocks! Learns which side of the dock a car is better to be parked! The prototype is of use…. Good modeling is real life—reduced! 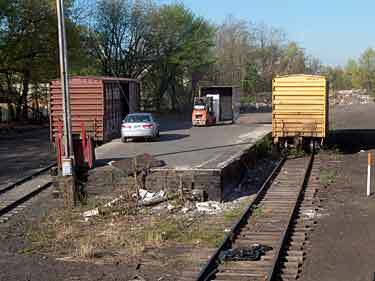 Stuart Pate, from Bolton, Connecticut USA, took these shots of a prototype Inglenook sidings that is in daily use in East Hartford, Connecticut on the Connecticut Southern Railroad. “It is used as a baled pulp transloading point for a small tissue mill that is located away from the tracks,” Stuart points out. 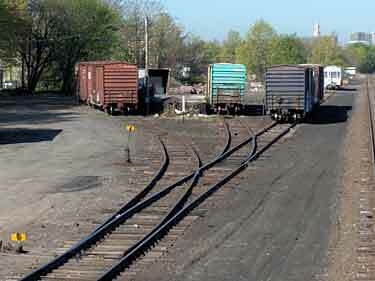 “As you can see from the photos, it has the required three tracks, two of which are at a loading dock that holds two cars per side, while the third is used as a ‘hold’ track before and during switching. “Normally, loaded cars are either brought in on the arriving train or stored on the right hand track. Upon arrival, the conductor of the train talks with the forklift operator on the dock to determine which cars have been emptied, and to receive instructions regarding the placement of the loads. Sometimes an outbound empty may be ‘buried’ behind a load, or a car may have a defective door on one side and have to be swung to the other side of the dock for access. Some of the inbound cars may have priority over others for unloading. This entry was posted in "DO YOU KNOW WHERE...?, "imagineering", a Caswell limerick poem, a consumation highky to be wished (Jeeves), a diesel electric loco, a great photographer!, a man;s preferences, A MECHANICAL ISSUE, a poet's preferred method, a railroad track, a usable prototype!, Uncategorized and tagged www.carendt.com on November 6, 2018 by Jonathan Caswell. This entry was posted in "DO YOU KNOW WHERE...?, "imagineering", "PLAY IT AGAIN...SAM! ", "Urban Options", a Caswell limerick, a consumation highky to be wished (Jeeves), a female viewpoint, a limerick, a man;s preferences, a reader's own envisioning, anticpating, appreciating wisdom!, appreciativ e, assumptions made and tagged a Caswell limerick, being thankful, city driving, on time, route memory, sufficient timing, wife's reminders on July 25, 2018 by Jonathan Caswell.